After all of the hype, we finally got a chance to drive the Toyota Rush. The shoot was held in Vermosa Sports Hub in Imus, Cavite. It was a bit of a scorcher that day. As it approached us from a distance, the initial impression was that it looks bigger than its rivals in the segment. ‘Baby’ Fortuner? Yep, you bet it is. As is the custom, we hopped into the middle row first to check out what passengers will expect, and we were impressed by the leg- and headroom. The quality of the materials and the feel of the cabin is very similar to the sturdy surfaces that can be found on its smaller sibling—the Vios. This is expected, especially as the Rush is competitively priced. The 1.5 E MT (five-seater) is P948,000; the 1.5 E AT (five-seater) is P988,000; and the 1.5 G AT (seven-seater) that you see here, can be had for P1,070,000. Pretty tempting. Here are some quick specs to tease you just a little bit. 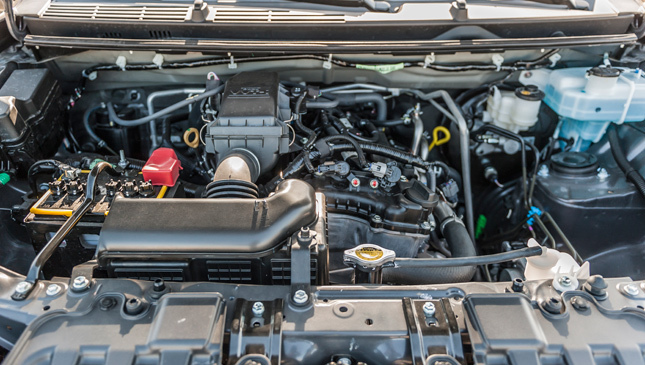 Under the hood is the same 1.5-liter mill found on the top-of-the-line Vios. It’s a four-cylinder motor that utilizes a timing chain, with variable valve timing for both the intake and exhaust cams. This is a very robust motor, which has seen extreme use in the Vios Cup one-make race held here and in Thailand. It’s pretty cool to see the motor oriented longitudinally in the engine bay, actually. And there is loads of space for wrenching under there if that’s your kind of thing. The motor is mated to a four-speed automatic in this G variant. The hardware keeping things steady on the ground are MacPherson struts with a stabilizer up front, with a rigid axle and five-link suspension at the rear. Wheels are an impressive 17in in the top-spec variant. Ground clearance, which is noticeably higher than the competition’s, is 220mm. This is perfect for the floods that we expect to encounter this coming rainy season. 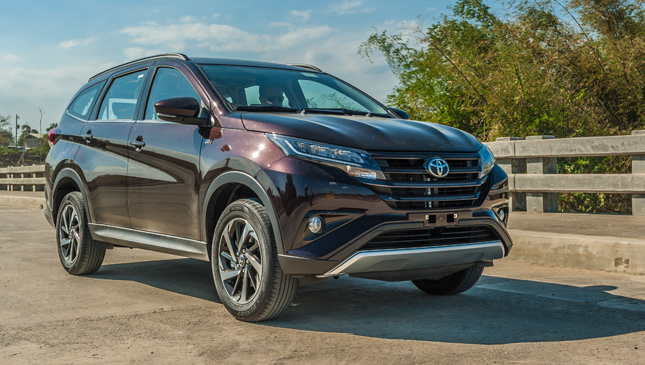 Once you get moving, the Rush offers a similar ride to its Avanza sibling, which comes as no surprise as they both have rigid axles at the rear. The ride smoothened out once we had passengers onboard, which just goes to show that the Rush was built to be a family hauler. We were impressed by the commanding seating position, too. No doubt the Rush is easy to drive. 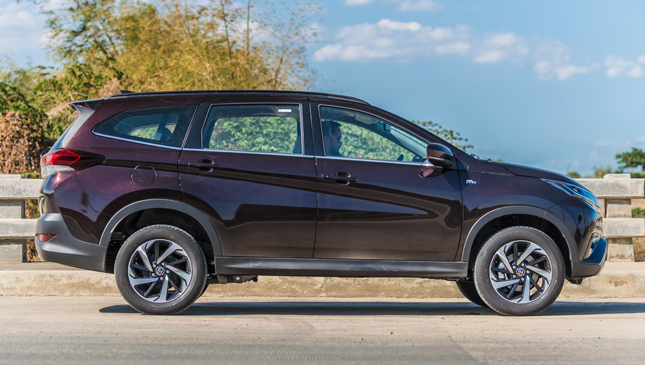 Notable is the tiny 5.2m minimum turning radius that will make maneuvering this entry-level SUV a cinch. 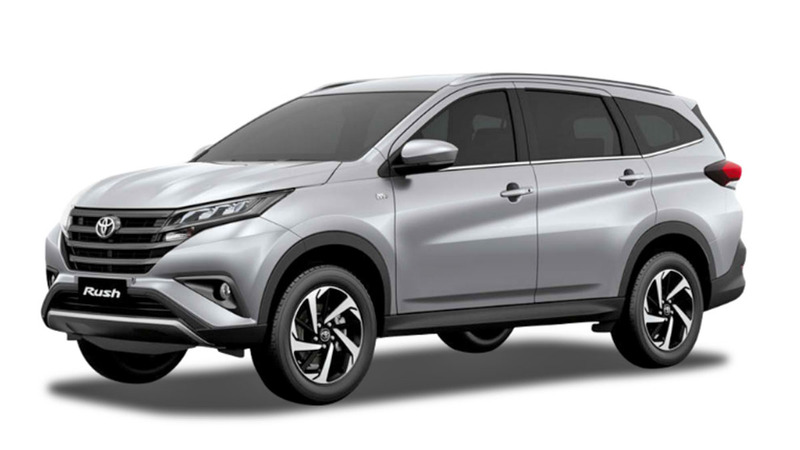 You can view the Toyota Rush as the ideal stepping stone toward being able to afford a midsize SUV, or the alternative if you prefer to have a smaller and more manageable footprint. Toyota doesn’t want it to be known as an MPV, mind you, so it packed it with upmarket features like the LED rear combination lamps and headlamps outside. Inside, there are three accessory outlets; a 7in touchscreen with Weblink connectivity for iOS or Android devices; backing-up display; and steering-wheel mounted controls. When it comes to safety, airbags are abundant (driver, passenger, front side, and curtain shield), and you also get hill-start assist, and, check this—traction control. Wait for expanded coverage in the soon-to-be-christened ‘Launch Pad’ section of our website, where you can see videos and more awesome photos of the Rush. Stay tuned.